Porcupines may prefer to be left alone, but if you have some living near or on your property then you may find that they are not content with leaving your home alone. Porcupines can do a lot of damage to your yard, your home and even your clothes if they can get hold of them. Porcupines will eat up all the plants and vegetable in your yard, strip the bark off of trees and eat all the flowering plants which can be really be a problem for people who take pride in their yard. Porcupines like anything salty and will chew on anything that has salt or sweat on it. If there are clothes left outside, wooden tools or old tires in the yard you can be sure that a porcupine will gnaw on them. If you have problems with porcupines, try some of these do it yourself tips to get rid of them for good. Trapping a porcupine is one of the most effective ways to get rid of them. However, you need to check with your state’s laws and regulations to ensure that trapping is legal in your state. You will need a special porcupine trap to catch them that you can pick up online and in some hardware stores. You need to bait the trap and put them next to their dens in the day so that you can trap them at night. Once you have caught them you will need to relocate them at least 10 miles away from your home. Wear glove and be careful that you do not get a hand full of quills as they can lead to an infection. There are repellents that you can use to make them stay away or leave your property. Some of the repellents that are aversive to porcupines are bobcat, king snake, fox, coyote and bears. However, be aware that these repellents do not work as well as they say they do. They need to be reapplied constantly and they are not guaranteed to work. You can also try to build a fence around your property or around your garden to keep the porcupines out. There are several options of fencing such as wooden, iron, wire, etc. but the only thing that you need to make sure of is that you bury it deep under the ground so that the animals do not burrow underneath the fence. If you do not want to do your entire property you can build the fence just around the problem areas. A great way to get rid of porcupines is to take away the things that they like. You can build a fence around your yard, make sure that your garbage cans are secured in your garage, keep all fallen and rotting fruit and vegetable off the ground and to keep all items that have salt on them out of the porcupine’s reach. Porcupines may look menacing, but they are actually very shy and solitary creatures. Porcupines that are native to the North American continent are mainly found in wooded areas where there is lots of food and places to take shelter. Porcupines live in burrowed areas where they stay during the day and then they come out to feed during the night. Porcupines come in a variety of colors, but what make them truly unique are their quills. A single porcupine can have more than 3000 quills that are all over their body that will come off in a predator’s skin if it gets too close. However, porcupines will rarely go after an animal or predator unprovoked; they prefer to go unnoticed that receive attention. Porcupines are the third largest of the rodent family and are native to America, Africa and southern Asia. They can be 25 to 36 inches in length and may weigh between 12 pounds to 35 pounds. They have a coat of spines that protect them from predators. They can be brown, grey or white in color are herbivorous in nature and like eating leaves, twigs, herbs and green plants including clover, cabbage and bark. Porcupines of Africa are found only on ground while those in America can also climb trees. They like to come out during the night time only but sometimes are seen in day time as well. There are about 29 species of porcupines in the world. The quills on the body cannot be projected to the target. Instead they drop out when somebody touches them or when they shake their body. A new quill takes the place of the old one. There can be around 30,000 quills on the body of one porcupine. At the time of birth, the quills are really soft and harden after a few days. Length of quills varies from one inch to 12 inches. Once a quill is inserted in the body of an animal, it is automatically sucked in more because the body heat of the animal draws the quill in even further. Humans can remove quills by using pliers while animals will usually use their teeth. They prefer to live alone but they will also form groups and stay in one den during winters. Porcupines are found in deserts, forests, hill slides and rocky outcrops in the tropical and temperate regions of America, Africa and southern Asia. They can be found at rocky areas which are as high as 12, 000 feet from the sea level. A few species are known to live in trees as well. They can be found at a number of places including caves, hollow logs and even old buildings. They generally inhibit the burrows made by other animals but can dig their own as well. The mating season begins in late summer and lasts till early fall. Males fight with each other for claiming rights of the females. They are also known to perform a special kind of dance to attract the females. Part of the mating and claiming ritual involves male porcupines spraying their urine on the heads of female porcupines. After mating, the female remains pregnant for seven months and gives birth to one offspring at a time. The young ones are known as porcupettes. Porcupettes are blind at the time of birth and open their eyes after 10 days. The mother takes care of them for about four to six months. They start eating solid food after 15 days of birth. Males attain sexual maturity once they are two and a half years old while females have reached sexual maturity by the time they are one and a half years old. Porcupines live for five to seven years in the wild while in human captivity they can survive for up to 10 years. 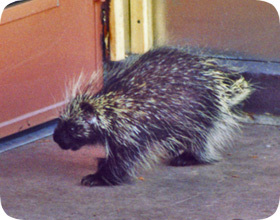 Though not very common, Porcupines may carry the rabies virus which can be transferred to humans in case of a bite or scratch. Porcupines are known to cause a lot of trouble. They may find their way into your garden and destroy the fruits, flowers and vegetation. If you have trees, they might start staying there and using them for food and housing which may harm or destroy the trees. They also dig burrows under your house which can cause damage to the entire structure. Porcupines can be disruptive around pets that get too close and end up with quills stuck in their skin.